Reba McEntire is more than just a highly-successful singer-songwriter, she’s something of an institution in the US. Following the release of her self-titled debut album in 1977, McEntire has gone on to sell more than 90 million records worldwide, find success as an actress and establish herself as a savvy businesswoman. McEntire is one of the most-celebrated Country singers of all-time and she’s still pretty prolific as an artist. In the four years she’s released four studio albums, including her latest release Stronger Than the Truth. Whether you’re a fan of Reba McEntire or not, you have to have enormous respect for her. A ground-breaking artist, McEntire has paved the way for many of today’s female artists and she’s often name-checked by them in interviews when talking about their inspirations and idols. Stronger Than the Truth arrives a few years on from McEntire’s divorce from Narvel Blackstock and it’s hard not to read between the lines when hearing the lyrics to some of the songs on this record. The album opens with the Western Swing of Swing All Night Long With You, setting the scene for a collection of traditional Country songs. 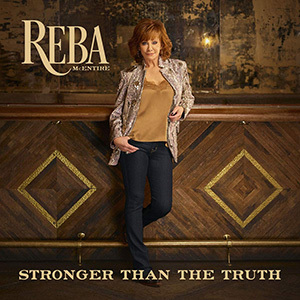 Title track Stronger Than the Truth, which was co-written by McEntire’s niece Autumn, is the kind of truth-telling song that McEntire does so well. It plays to her strengths as both a storyteller and an emotive vocalist. For Storm in a Shot Glass McEntire lets her hair down and you can see how she was the inspiration for Nashville’s Rayna Jaymes. The feisty number is the kind of big anthem that Reba has ruled the charts with over the years and it’s a strong moment on this record. The Brandy Clark co-write Tammy Wynette Kind of Pain deals with the heartbreaking realisation that a relationship has run its cause using the songs of Tammy Wynette to tell its story. Cactus in a Coffee Can, a song which sees McEntire connecting with a young woman on a flight who found her birth mother, is a cover of Jerry Kilgore from his 1999 album Love Trip, and No U in Oklahoma, co-written by McEntire with Ronnie Dunn, is another swinging moment that should translate well in her live shows. Elsewhere on the album The Bar’s Getting Lower (sadly not a political statement) tells the story of an ageing woman whose life hasn’t turned out the way she planned it to, Freedom is a powerful anthem, and The Clown is a heart-wrenching song about trying to hide your pain by plastering a smile on your face. Piano ballad You Never Gave Up On Me brings the album to an end and it’s a beautiful moment. For me, McEntire shines brightest when things are kept simple and accompanied only by piano, she sounds magnificent. Stronger Than the Truth is a celebration of traditional Country music and stories are most definitely at the heart of the album. If you’ve never liked McEntire, you’re unlikely to start now but if you enjoy her brand of truth-telling Country then you’ll find plenty to enjoy. There’s no other artist in the genre like her and truth be told, there probably won’t be again.